Roots Herbal White Shampoo is a non-irritating, high quality shampoo specifically developed for white and light colour coats. Roots Herbal White Shampoo is a natural herbal pet shampoo formulated with whitening pro-active substances from traditional herbs such as Indigofera Trinctora Plant and Horse Chestnut Tree. 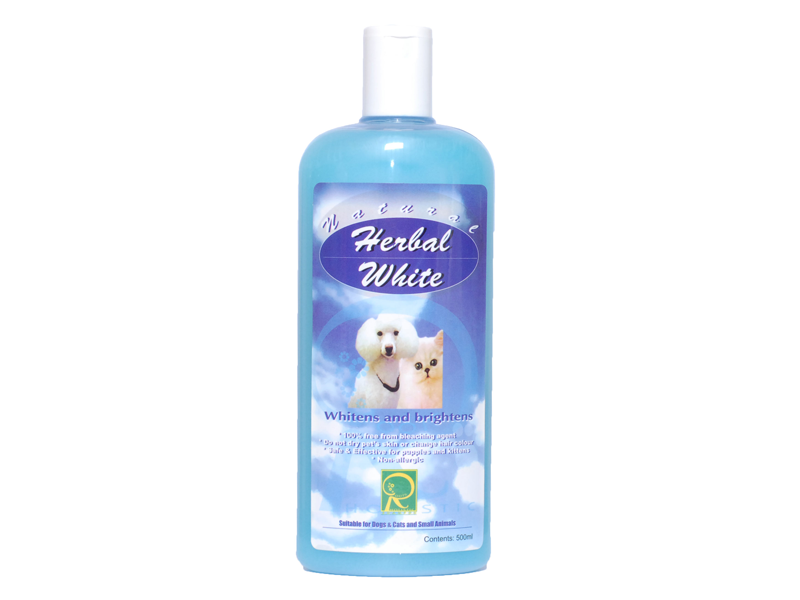 It has been specially designed to be 100% free of bleaching agents, thus can be used on both white and coloured pets. – Indigofera Tinctora Lin (It contains indigo pigment, an ancient blue coloring substance. It is an effective whitening agent from plant and has been used from ages). – Horse Chestnut Tree (Contains characteristic shinny inflorescence substance when integrated with indigo dye leaving the coat shiny and brighter. It also possesses anti-inflammatory and anti metastatic properties for good health of pet’s skin and hair).